Last fall I became a quilter for the Haven Circle of do. Good Stiches. I have been involved in do. good stitches for a few years, but only as a stitcher, making my blocks every month and sending them to the quilters. Our circle lost a quilter, so I decided to step up to the plate. 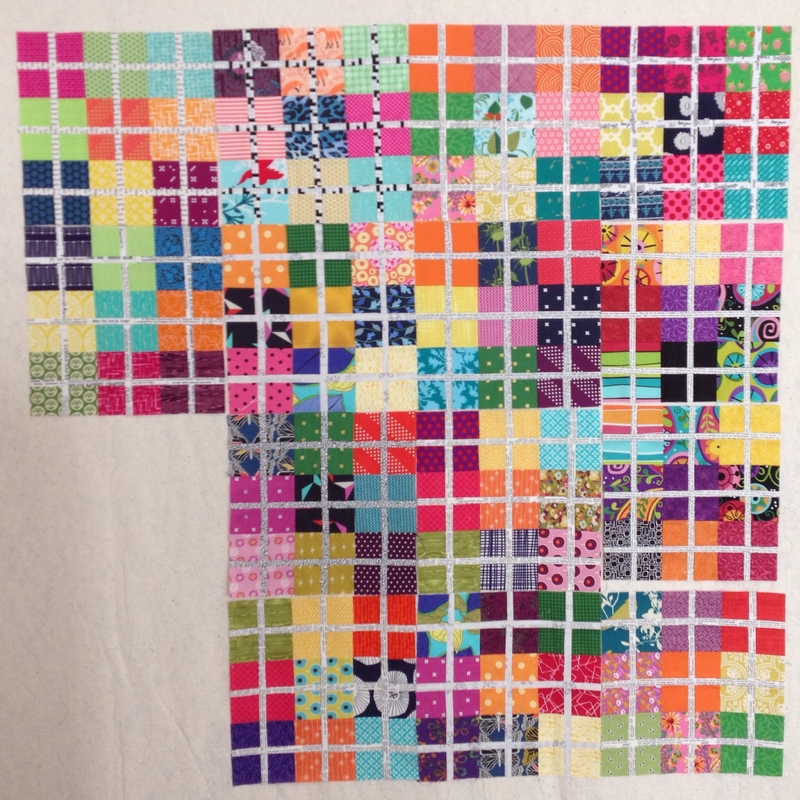 My first month to be quilter was November 2014. I wrote a tutorial for a block here. It was so exciting to see the blocks trickle in and play with them on my design wall. I did have a few blocks that measured a little small, so I had to get creative on the layout and turned the corner blocks on point. I'm really happy I had to make a design change, as I probably never would have without the smaller blocks. I quilted on the diagonal and used the eco friendly Quilter's Dream Green batting. Oh my gosh, I don't know if it's the diagonal lines or the batting but it is the softest quilt! I backed it in this wide ikea print that I bought in a destash from my friend, Lisa. 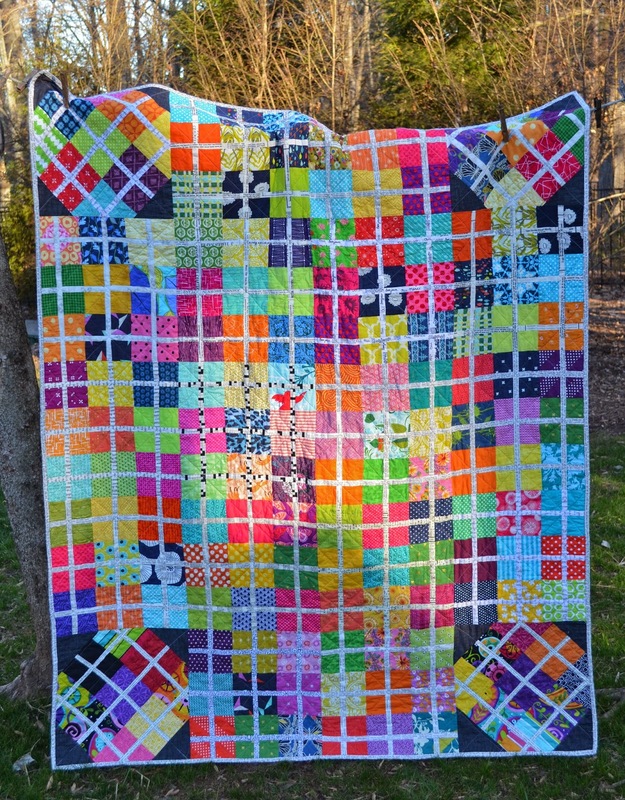 I love it and love that I have enough left for another quilt back! Of course the binding had to be text print, so I chose one of my favorites, from Carolyn Friedlander's architextures line. I just need to get it labeled and then this will be on its way to comfort someone in the unimaginably difficult circumstance of being in a women's shelter. I've written about this before, but I just love that do. Good Stitches provides such wonderfully beautiful objects of comfort to the recipients. People that surely have seen one to many hand-me-down or cast off item. Warms my heart. It turned out so nice! great idea for the corners-(oops, sorry, one of them is mine.) -i NEVER would have thought of doing that! What a great quilt. I had missed the original tutorial so thank you for linking back to it.